Customers are greeted with complementary coffee, water, and wine when they enter Bell’s comfortable and cozy salon. Bell and her style experts work tirelessly to ensure each individual customer is treated with care. Unless the client is in a hurry, rushing is simply not an option. Stylists first consult with their customers before ever diving in with scissors. If the individual in the chair has a specific vision for his or her haircut, color, style, or makeover Bell’s team makes it happen. If a client is unsure on a style, Bell’s team makes suggestions and devises a style plan with the customer. Whether a client is looking for a simple trim or an all-out brand new look with edge and pizazz, Hair is my Business runs the gamut. With each new style, technique, product, or trend that emerges in high end fashion, Bell and her staff are on top of it. Additionally, her products and equipment are always top-of-the-line. 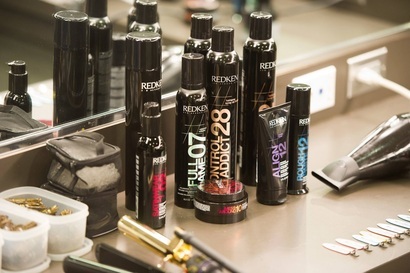 A certified Redken salon, Hair is my Business is always among the first to sample and sell brand new Redken products. Matrix, Mary Kay, and other best-of-brand products are always on Bell’s shelves. Without pushing her customers to purchase products, Bell always recommends the best products and practices for keeping hair healthy and extending that beauty salon look for as long as possible.